The 8th District Republican Committee invites supporters to join U.S. 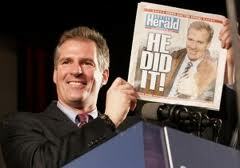 Senator Scott Brown (R-MA) (official | campaign) for a Chairman’s Book Club fundraising event on Monday, June 20. Sen. Brown shocked the political world by winning Massachusetts’ Senate seat as the Republican nominee early last year. He will be signing copies of his newly-released book, Against All Odds: My Life of Hardship, Fast Breaks, and Second Chances. All tickets and sponsorships include a copy of Against All Odds. The Chairman’s Book Club event on Monday, June 20, from 7 pm to 9 pm at the law offices of Mark S. Allen, 111 Oronoco St. in Old Town Alexandria. Purchase tickets here or RSVP to Shari. “Dramatic. . . . Poignant. . . . Scott Brown’s life could have veered horribly wrong so many times, as he amply demonstrates in his disquieting memoir. . . . A reader will get an everything’s-finally-right-with-the-world thrill from his success in life.